I will be honest with you. Before 2002, I had never heard of Narendra Modi. This is mostly because Politics is a new field of interest for me and at that time I was a kid of fourteen years. Those were the periods when Narendra Modi was vilified and his name was spoken with a tone of disapproval by most people. Cut to 2014, Narendra Modi is the most popular person in India and BJP won the elections riding on his name. In 30 years, a party has come in majority that isn’t Congress and credit is being given to Modi for the transformation. This rise in popularity started with his work in Gujarat and winning 4 consecutive elections there. However, the true push happened when he was appointed as the candidate for Prime Minister by Bhartiya Janta Party (BJP). The rise of popularity can be easily measured by the number of seats that his party has won in the Parliament but there are other signs as well. In the internet world, Modi’s rise has been phenomenal. On Twitter, according to Twiplomacy, he is now the 6th most followed person. His handle (@narendramodi) has 4.26 million followers growing at a rate of 6.77% weekly, 12.22% monthly and 24.26% quarterly. This is a phenomenal growth. If the country grows at this rate, we might be the largest economy by the end of Modi’s tenure. Twiplomacy is Burson-Marsteller’s annual study that tries to find out how much the twitter is used by World leaders. 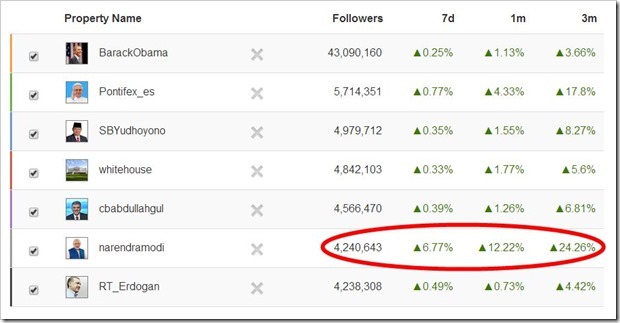 Besides this, Modi is also the second most followed person on Facebook after Barack Obama. His page has overshadowed people like Mitt Romney during the general elections and is even now growing at a faster pace than Obama’s (1.171% to 0.305%). The pace should slow down as the elections are now passed and the country will soon be back to its normal situation after the frenzy that was this election. It might still be enough to take Modi close to the top slot and threaten Obama’s position if not take it altogether. According to Andy Stone (Facebook Policy Communications), from the first day of the election announcement to the final polling day, over 29 million people had 227 million interactions on Narendra Modi’s Facebook page. These interactions comprise every post, comment, like and share. This number is almost two-third of the whole Indian Active Facebook population with 10 interactions per user. 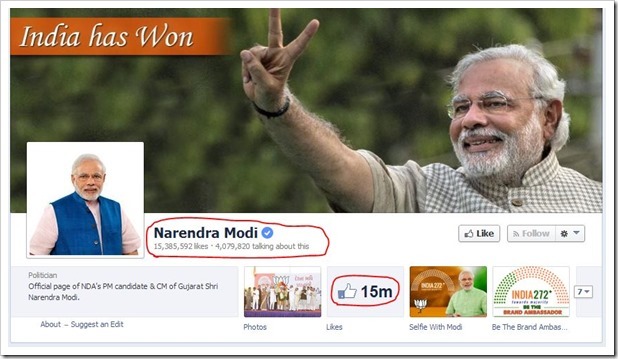 Out of these 13 million people made 75 million interactions regarding Modi. This is a phenomenal growth and simply reinforces the impact Modi has had on the elections. Ironically, it was his competition with Arvind Kejriwal (leader of a first time contesting AAP) that gained more prominence than with Congress (the veteran of the game). This also suggests that Modi’s actions will be looked on more keenly than for previous Prime Ministers and more people will be following him closely. He cannot blunder where others might have. Do you think Modi can cross Obama? ?